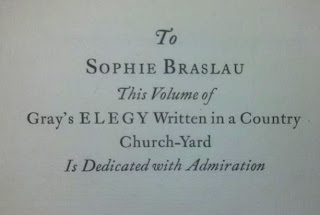 The Dedication Copy! My wife in the next room wondered what my throaty exclamation was all about and why I’m suddenly drinking a five-star craft beer at 10:30 am. I have other dedication copies in my collection, but there is always space for one more. Braslau’s exact relationship with Clark—platonic or not-- will require further research but the acquisition got me thinking more about Clark’s life and his collecting. His highly successful public endeavors were intertwined with a complex and often tragic personal life. 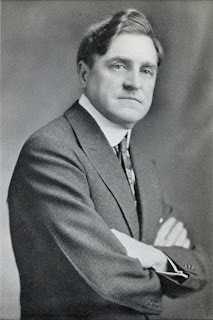 William Andrews Clark, Jr. (1877-1934), son of a Montana copper baron and U.S. Senator, had no cash flow problems. In the face of such easy material living and the temptation for dissipation and squandering, he retained an admirable focus on achievement. Just as importantly for posterity, he developed a philanthropic nature. Clark, born in Montana, received a varied and high quality formal education in Europe at a very young age. His first language learned was actually French and he was a lifelong Francophile. He later attended public and private schools in New York, California, and Virginia where he graduated with a law degree from University of Virginia. After a short stint as a lawyer he joined the family copper business in 1901. Will Clark began collecting around 1909 in haphazard fashion buying American literature, English literature, French books, books on tobacco, fine bindings, and fine press books. In 1911 he made a purchase from bookseller E. Byron Hostetter of Boston-- a selection of works by Oscar Wilde including The Ballad of Reading Gaol (1898)-- that eventually would culminate in one of the finest single author collections ever assembled. From the late Teens until the Great Depression of the early 1930s when copper prices sank into oblivion, Clark was all in when it came to the rare book collecting game. He was very interested in 17th and 18th century English literature, poetry, and culture. A world class John Dryden collection anchored this area. Tempted by availability, unburdened by financial restraints in the Roaring Twenties, and influenced by Charlie’s similar interest, he succumbed often in the field of Elizabethan and Jacobean drama. The result was a superb collection peppered with rare Shakespeare quartos and the Four Folios in multiple copies. He also gathered other important book and manuscript collections of early printing, later English literature, French material, Western Americana, and Fine Press books including complete runs of the Kelmscott and Doves Press. His personal life was filled with regular sorrows. Will Clark would lose two wives and his only child. His first wife, Mabel, died in 1902 only a month after giving birth to his son, William Andrews Clark III, nicknamed Tertius. Teritius would be killed in a plane crash in 1932. Clark married his second wife, Alice, in 1907. The family moved to Los Angeles shortly thereafter where the Clarks became rooted to the community. Alice died in 1918 and Clark, just past age 40, never re-married. All this upheaval certainly intensified his book collecting and fostered his other major interest in music as a source of relief. 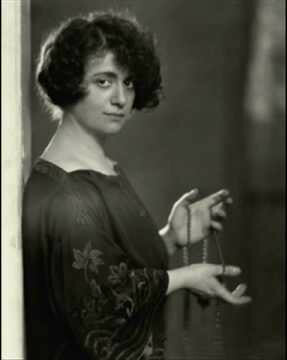 Music was his connection to Sophie Braslau. Clark was an accomplished violinist and in 1919 organized and underwrote the Los Angeles Philharmonic Orchestra with whom he occasionally played. With the expertise of Cowan and the help of two other library assistants, Cora Edgerton Sanders and Harrison Post, Clark produced a twenty volume private library catalogue between 1920-1931 of his holdings (eighteen volumes describing material and two index volumes). The catalogue itself was a high quality fine press production printed by John Henry Nash of San Francisco. 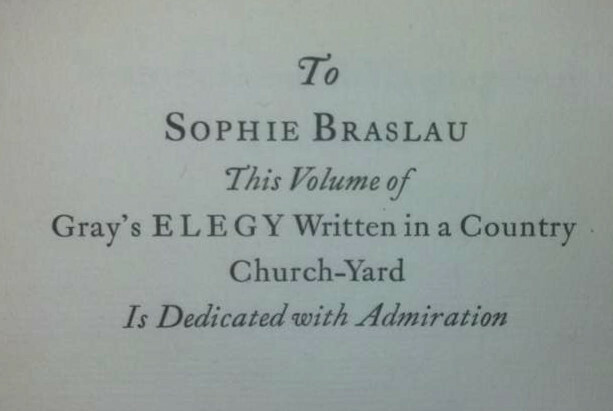 Clark also issued eleven limited editions printed by Nash focusing on specific books and authors in his collection such as the Gray volume inscribed to Braslau. Clark participated heavily in the production of the volumes, contributed introductions, and oversaw the descriptions and printing. Few other prominent American collectors have ever been involved so intimately and extensively in the publication of their own library catalogue. It’s obvious that Clark had a bibliographical bent. He took public pride in his accomplishments and wished to record them for posterity. Also, his brother Charles had earlier produced a privately printed catalogue of his library using Nash as printer so Will had that for motivation. All collectors innately strive to create order with their collections. Clark’s strivings were over-sized. Perhaps this hyper-productive activity was a result of trying to bring order to inner turmoil, to normalize his public persona in contrast to a personal world marked by tragic losses and untidy desires in an age not so open as today. And this brings us to Irish writer and poet Oscar Wilde (1854-1900). Wilde was Clark’s first major author collection and it remained foremost throughout his collecting career. Six volumes of the eighteen of his library catalogue are devoted to Wilde books, manuscripts, letters and miscellanea. 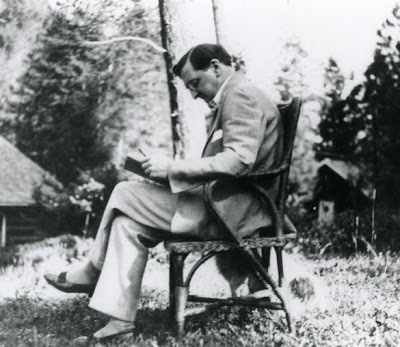 Clark relentlessly chased and cajoled Wilde material from all the major book dealers, at auction sales, and from personal associates and family members of Wilde. But why was he obsessed with Wilde? What drew Clark to his works and the man himself in such a strong fashion? 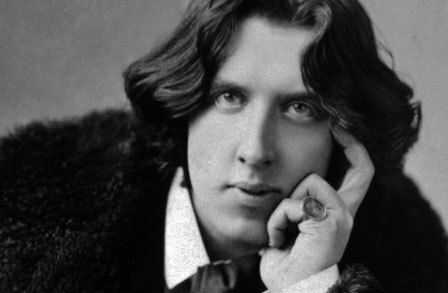 Oscar Wilde was not only a great writer but a bon vivant who became the subject of huge controversy in his day when he was convicted of “gross indecency” in a series of trials that electrified the public. Homosexuality was illegal in Victorian England and when Wilde began a not so subtle relationship with Alfred Lord Douglas, son of the Marquis of Queensberry, all hell broke loose when the Marquis confronted Wilde. Wilde’s trials and conviction resulted in a two-year prison sentence of hard labor. When he was released in 1897 he was a broken man physically and spiritually. Wilde had been married as well and his wife refused to let him see his two children. Only a few of his closest friends remained and he died destitute in Paris in 1900. So, there you have the possible seeds of a complex private life that resulted in the formation of one of the most impressive single-author collections by an individual collector. Nowadays such personal revelations would carry smaller weight on a more tolerant society’s much larger scale. But to Clark, only a couple decades removed from Oscar Wilde’s trial, it would have been a bigger challenge. In 1923 a fire at Clark’s residence gave him a serious scare and he had a separate fireproof library building constructed on his property for $750,000. Lawrence Clark Powell called it a “jeweled oasis in a city of stucco.” Clark retired from business in 1926. 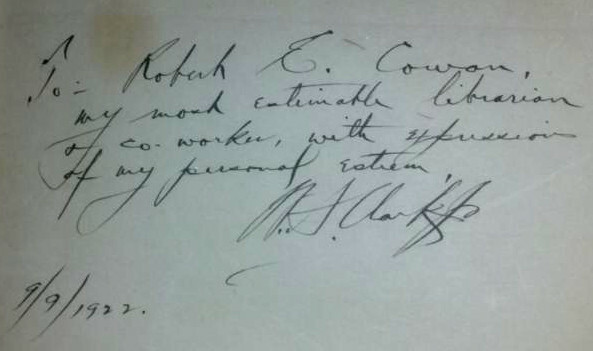 In June he wrote the board of regents of the University of California, “For some time it has been my intention to make a conditional gift of the library building, the books, manuscripts and equipment contained therein, and the real property, where I reside while I am in Los Angeles, California, so that the grounds may eventually be used as a park by the public, generally, and the library building and its contents by students for research.” The wording and structure of the gift were modeled closely to that of the Henry Huntington Library. 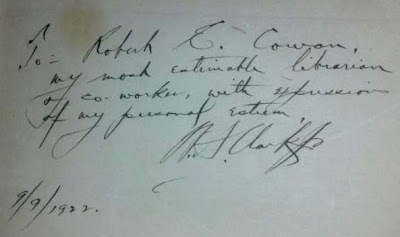 Clark retained a life estate on the property and books. William Andrews Clark, Jr. in the end, like Oscar Wilde, found himself most comfortable in France. Like Wilde, he was creative, passionate and after following the family path, struck out on his own. However, unlike Wilde, he had a reticent personality and was not overtaken by rashness in his decision-making or a naive sense of personal immortality. Characters such as Sophia Braslau and Harrison Post added texture and biographical interest to Clark’s life but do not overshadow the remarkable cultural legacy he succeeded in establishing. Notes on sources: The best sources on Clark as a collector are William Conway’s essay, “Books, Brick and Copper: Clark and His Library,” in William Andrews Clark, Jr.: His Cultural Legacy (1985) and Joseph Rosenblum’s essay in the Dictionary of Literary Biography, Vol. 187: American Book Collectors and Bibliographers (1997). Dickinson’s Dictionary of American Book Collectors (1986) lists other important sources including the Powell article. An online search will pull up interesting tidbits.